Carbon Fiber Sunroof Insert/Delete – Northwind Composites, L.L.C. One of the first items Northwind brought to market was our specially designed carbon fiber sunroof inserts and deletes. We know that many track cars start their life as daily drivers and racers begin building, adding, removing, and modifying their car until it is the machine they want. Weight reduction is always a large part of this process. Anyone who has ever taken apart a sunroof assembly knows how much weight can be saved by removing the glass, or even the entire system. And that is where Northwind comes into play. 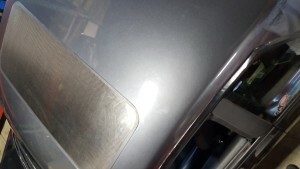 By combining efficient design, advanced materials, and proven manufacturing techniques we can produce a carbon fiber sunroof inserts that weigh an average 29 ounces. On the BC/BF chassis this translates to a 26lb weight savings with the delete installation. Each insert is made from a combination of 2×2 twill 3k70 carbon fiber, 7781 E-glass fiberglass, core, and epoxy resin. The insert is infused with an aerospace grade UV resistant epoxy resin and cured at 170 deg. Fahrenheit. The epoxy resin will not shrink or off-gas like polyester resins and is dimensionally stable. The thickness of the carbon insert is 0.170in thick and the factory glass is 0.200in thick, providing room for your clear coat. Additionally, every mold is manufactured directly from the factory glass to ensure that the contour precisely matches the glass and the roof line. 1) The first option is an insert with external dimensions exactly matching the factory glass. This allows the insert to be installed into the factory tray system providing a weight savings while still allowing you to enjoy the wind and sun on a summer day. The installation of this insert is identical to the OEM installation. 2) The second option is an insert that is oversized so that it completely fills the hole in the chassis. This allows you to completely remove all the factory tray, motor, and mounting system but requires the insert to be permanently mounted to the chassis. Northwind does have a recommended installation guideline – here – but there are many ways to skin the installation cat. Please note that these parts are not clear coated. Northwind specializes in advanced engineering and manufacturing, not spraying clear. Therefore, we will leave the clear coating to you or your favorite painter. Our parts have a high gloss out of the mold but we do recommend a professional grade clear coat to really make it shine. – Nissan S13 Coupe *We have two different molds for the S13 Coupe, please contact us for details and questions. If you have a chassis that we currently do not support, please contact us. We are always happy to work with customers to get new molds online.